They were a jazz fusion band active 1975–1980. Noted members included Phil Collins (drums), Percy Jones (bass), John Goodsall (guitar) and Robin Lumley (keyboards). Not long after jazz/rock fusion greats Brand X put out their 1980 album, Do They Hurt?, the band members went their separate ways (until their comeback in 1992, which only featured Goodsall and Jones). However, they still owed their record label one more album. The solution? Release a rarities album! The problem, though, was that Brand X hardly had any unreleased material in the vaults at all; about three or four tracks at the most. But with a little doctoring & remixing of tapes, keyboardist Robin Lumley extended that number to six tracks (still scant, but better than four), and released Brand X's appropriately-titled collection, Is There Anything About?, in 1982. '“Ipanemia": written by guitarist John Goodsall, this piece is an excellent jazz/rock popper. Very cool and breezy. '"A Longer April": this track is exactly what it says it is---a longer version of "April," from 1979's "Product." Either this is how Brand X originally recorded the tune before having to edit it down for the "Product" album, or Robin Lumley extended the track by doing some re-mixing on it. Either way it's a very dreamy, pleasant piece, and I like it. I also like the spacey little bridge section that's been added to it. '"TMIU-ATGA": as the liner notes say, the title stands for "They're Making It Up As They Go Along." Lumley, fellow keyboardist Peter Robinson and bassist John Giblin improvised this short piece in one take, and Lumley stuck it onto the album. Filler? Perhaps. Instrumental noodling? Perhaps. But it's interesting. '"Swan Song": a fun, poppy, keyboard-heavy instrumental, with a big "Ohh-ohh" chorus at the finale. Some fans reacted to this track with, "Oh my God, they've gone pop!" Chill out, you guys. I think there's always been an oh-so-subtle pop influence to a *little bit* of Brand X's music (just a little bit, mind you), so I don't mind if the band go whole hog and do a rare, full-on pop-music piece. And "Swan Song" IS a very good pop-music piece. 5. IS THERE ANYTHING ABOUT? Brand X are one of those snooty for musician’s onlybands that the casual rock fan has either forgotten about, or never paid much attention to in the first place. Okay, so they are not really a rock band so much as they are a Prog-Fusion band…if that is even really a genre. Let’s just go with jazzy stuff with some guitar solos thrown in for good measure. Oh yeah, the band had a pretty famous drummer named Phil Collins as well…which makes these releases even more interesting. Joining Collins were Percy Jones (bass), John Goodsall (guitar) Robin Lumley (keyboards), and Morris Pert (percussion), with sometimes Mike Clark, Kenward Dennard (drums), and John Giblin (bass). The band were kinda-sort Phil’s side band so he could get his jazz thang going on outside of his day gig with Genesis. But, they were good musicians…actually they were great musicians and these albums are worth checking out if you’re into the whole ‘damn these guys are good’ jazz proggy kind of stuff. Gonzo Media done good digging up these gems. The three Brand X releases unleashed here are Live at the Roxy 1979, Is There Anything About? and Missing Period, which features unreleased music from Brand X’s infancy. For good measure, Gonzo Media are also releasing bassist Percy Jones' hard to find solo offering from 1989 Cape Catastrophe. The live disc and the newly discovered ‘lost’ music are the best of the bunch but all of the releases are worth the price of admission. After one listen you will be impressed with the band’s overall musical virtuosity. I like this album a lot. It seems to be more diverse than some of the rest of Brand X’s catalog. Sure, there is quite a bit of jazz and fusion here. But there are also plenty of more pure progressive rock moments. Things like Deep Purple and King Crimson are valid reference points at times. 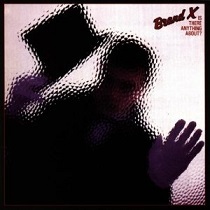 Fans of Brand X will find plenty to like on this reissue. It would also make a good introduction. IpanemiaThis opens up as pure fusion. The cut has a smooth, fairly mellow jazz sound to it. Still, it’s got a lot of energy and some of the keyboard sounds lend something a little meatier. There is some tasty acoustic guitar soloing on the number, too. There are some funky elements at play from time to time and it does get more fired up later. A Longer AprilComing up very gradually, early on this is just bass and percussion. In fact, it’s about a minute in before some keyboard textures emerge over the top of this. Even then, they rise up gradually. As the piece continues to evolve some guitar brings new energy and melody to play. Saxophone comes over the top in fine fashion. As the piece continues it explores some proggy jazz stylings. It drops to some really spacey sounds later. Then mellower jazz takes over. Tmiu-AtgaComing in fairly sedate and intricate, this is more purely progressive rock as it starts. It evolves into some definite electronic music, perhaps a bit like Vangelis, but with a space edge to it. Keyboards and bass perform a tasteful dance around one another as this keeps building. Although this continues evolving, there are no big changes. Swan SongThis powers in feeling a lot like King Crimson. It’s noisy and very cool. More melodic elements are brought into the mix as it continues. There are some non-lyrical vocals later in the piece. There are also some more fusion-like sounds built into it further down the road. Still, that King Crimson element remains in some ways throughout. This builds out into quite a dynamic and powerful piece of music. Is There Anything About?The rhythm section opens this and the bass drives some intriguing paths as it works forward. As other elements join the title track takes on some hints of space music. There are also hints of things like King Crimson. Then it works out to a killer fusion jam that’s melodic and very effective. It gets more rocking and quite energized as it continues. Each musician contributes a lot to this, but there are some definite moments where the keyboards and drums stand out the most. Of course, that said, Percy Jones’ bass playing is always amazing. Modern, Noisy and EffectiveThis is modern, noisy and effective. I just had to start this off with that given the title of the song. Yes, it was obvious, but it had to be done. It actually starts off with a rhythm section that makes me think of Deep Purple just a bit. Then we’re taken out into a melodic jam with a very familiar sounding melody. There are moments here that almost feel like disco a bit, but other moments make me think of Jean-Luc Ponty a little. There is a harder edged keyboard driven movement later that I just love. That section is eventually faded down to end the disc in fine fashion. 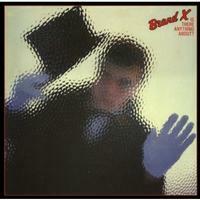 Apparently clouded in controversy, as one reviewer put it, is Brand X’s album Is There Anything About? that was released as a contractual obligation just before the bands demise (until later in the 90’s). The album seems to be a pick-a-part job taken from previous albums and lengthened by keyboardist Robin Lumley. The result is a mostly atmospheric album that features a lot of very boring contemporary jazz-lite stuff that has the smell of sci-fi inspired quirkiness that most fans declined. For me, this is my third Brand X review. Not really a great follow up to Missing period, which has so far been my favorite of the trio of albums I was sent for review. Missing period was a fun jazz fusion dose of cool that could have easily been the inspiration for bands like Medeski, Martin & Wood or even some of the Beastie Boys more funky groove laden tunes. It was fast in parts, slow but substance filled in others, while this album simply falls limp from the get go. Now, I understand if you’re a professional Jazz musicians and can appreciate the technique and style on the album. I would never say that the band ever feels like they don’t know what their doing. Unfortunately a majority of it sounds like sound check or experimentation. I really couldn’t find my place within the music, no real connection and, from what I’ve read, I’m not alone. The only way to know for sure is to check it out for yourself. UK label Gonzo Multimedia are in the process of releasing some rare recordings from the Brand X and Percy Jones camp. This one, Is There Anything About? was originally released back in 1982, not long after the band delivered their popularDo They Hurt? album and then subsequently went their separate ways. Problem is, the band still owed their label another record, so they went into the vaults and found some rarities and unreleased material that ultimately became Is There Anything About?. The musicians contained on the album include Phil Collins (drums), Percy Jones (bass), John Goodsall (guitar), Robin Lumley (keyboards, vocals), Peter Robinson (keyboards), John Giblin (bass, whitbread, vocals), Raf Ravenscroft (saxophone), and Steven Short (syndrums, vocals). Last album with Phil Collins on drums, "Is There Anything About" is firmly rooted in the 80s as evidenced by its ultra-polished production and (some) too clinical. Dice 'Ipanaemia' guitar can clearly hear John Goodsall as rarely before then or in groups of jazz-rock as demonstrative Uzeb at the same time. 'A follow April' exudes a more contemplative atmosphere that recalls some work Weather Report on 'Tmiu Atga', it highlights keyboards Robin Lumley in a synthetic environment thatVangelis himself would not have denied. Maybe 'Swan Song' seems a little dated as its keyboard parts you probably remember the Genesis of "Abacab", one can even hear the hearts there to talk about the strong influence of Phil Collins on this composition, it there is a not your servant can take. The title track is probably one of the best songs of the album. Starting with a set of cymbals and repetitive low enough fine-tuned, this piece is expanding gradually with the addition of other instruments (keyboards, guitar) to move towards a rather successful tribal-jazz atmosphere with a final in which Phil Collins shows his talent as a drummer emeritus. The last composition "Modern, Noisy and Effective" unfortunately fall a little bellows with his keyboards a bit kitsch but finally willing rooted in a time when fusion had found its place in popular music. This 2013 CD reissue of a 1982 album features 34 minutes of contemporary jazz music. This album's band line-up is: Phil Collins (on drums and concussion), Percy Jones (on bass), John Giblin (on bass and vocals), Robin Lumley (on keyboards and vocals), Peter Robinson (on keyboards), John Goodsall (on guitar), Raf Ravenscroft (on saxophone), and Steven Short (on syndrums and vocals). With this album, the band shifts from adventurous progrock to a more steadfast dose of contemporary jazz. While the guitar has its moments in the spotlight, a lot of the lead licks belong to the bass. Its sultry vibrations lend an urban flair to the tunes, evoking evenings spent in smoke-filled cafes. The instrument issues notes wrapped in popping throbs. Meanwhile, when the guitar shines, it does so like the sun at high noon, dazzling and crisp. Slithery notes cascade into sinuous riffs of an almost romantic character. The percussion is more relegated here, delivering modulated locomotion to the music with durable but often restrained rhythms. The keyboards exhibit a similar restraint, invoking softer sweeps and delicate pitterings that ooze through the mix with tasty subtlety. The introduction of saxophone completes the band's transition to modern jazz. The horn injects a cerebral quality with its willowy wail. The vocals that are present in one song are lyricless croonings. These compositions, as one might've picked up on, are more straight-ahead modern jazz in style. The passion is still there, just subdued into a relaxed mode. Near the end of the album, though, the pace and intensity increases, offering tunes more of the band's forte.